Turn Up Your Speakers And Watch This Important Video. LLC’s Have Great Money-Saving Benefits, But Most Are Worthless! Before telling you why, first the “Potential” Power of LLC’s for real estate… Limited liability companies (LLC’s) are powerful entities because they have all of the legal benefits of a corporation; yet all of the excellent tax advantages of a general partnership; yet avoid the legal disadvantages of a general partnership and avoid the tax disadvantages of C-corps, S-corps and limited partnerships. They also avoid much of the legal complexity of corporations and limited partnerships. In short the best of all worlds…unlike any other entity. LLC’s can be used for all types of real estate transactions… Residential rental, commercial, wholesaling, short sales, rehabbing, new construction, sub-divisions, condo conversations, etc. So powerful are LLC’s, they have diminished the importance of limited partnerships, family limited partnerships, C-corporations, S-corporations and land trusts (although they can be combined with land trusts). • Enable you to successfully operate your real estate business. Notice the above words “Potential Power”. Below are the reasons why most LLC’s never reap the power of their great benefits. Do not shield you, causing your personal assets to be totally exposed. You therefore are not protected from legal actions (when you should). It is not the size of the entity, but rather the existence of complete and proper documents which provides the protection from personal liability for the LLC members. Do not save you in taxes (when they should). Having certain Tax Elections and Tax Matters in the operating agreement and other LLC documents can generate for you, yearly tax savings you didn’t even know about. Do not defend you against IRS (when they should). IRS auditors typically examine LLC legal documents to see if they support tax deductions and strategies. If they don’t, you are out the deductions and A LOT OF MONEY! Do not prevent legal disputes with partners or others (when they should). Having the proper language would do this and save you from costly lawsuits. Do not give you important operating guidelines for successfully running your business (when then should). LLC documents (esp. the operating agreement) should also be your roadmap to help you implement a profitable real estate business. In short, most LLC’s simply do not give you the significant dollar-saving benefits that a well designed & documented LLC should give you! NOTE: The documents can be used to also restructure your existing LLC with these same great money-saving benefits. This LLC forms package is specifically targeted to real estate operations. Thousands of hours and dollars have been put into this program. Nothing like it before has ever been created. You will not get it anywhere else. THE REAL ESTATE OPERATING AGREEMENT EXTRAORDINAIRE – The operating agreement (OA) is the nuclear LLC document. It is the “heart & soul” of the LLC. The OA Extraordinaire that we prepare for you is the most powerful OA ever. Adaptable in all 50 states, it is specifically designed for your real estate business so that the LLC’s specific business purpose* is clearly defined. *Importance of Having a Specific Business Purpose – Most OA’s do not state a specific business purpose. To the contrary, the specific business purpose should be explicitly stated to make it legally clear to the members, and if necessary to third parties. Our OA (and other LLC documents) are specifically for real estate. Not only does this aid to successfully accomplish the LLC’s intended business purpose, but also has other advantages such as avoiding the costly tax status of being a dealer. Complete legal protection. At 121 pages in length, our OA contains over 240 legal provisions that cover every legal facet of your real estate investment operations so the LLC is an entity separate and apart from you. That is, the affairs of the LLC are not yours personally. Consequently, these provisions will give its members (you) limited liability protection, therefore making it very difficult for any court to pierce its entity veil. As a result your personal assets are protected. Avoid disputes. Included are special provisions to help prevent legal disputes with partners and others. You avoid expensive trial lawyers and the courts. Comprehensive tax-saving provisions. Like no other LLC documents, there are 11 Tax Elections* to give you favorable tax results that save you money. *Tax Elections are special tax law provisions that are usually favorable to the taxpayer, but which generally have to be made within a certain time period and in a certain manner. By having them in the OA, you have a reminder checklist so you don’t forget them; or in case you do forget, you have excellent support in that by having the election already contained in the OA (a legal document), the election is timely and properly made. Also included here are certain tax elections you should avoid in order to audit proof yourself against the IRS. What protection! The OA also contains 35 Tax Matters all backed up by an arsenal of complete tax law cites authorizing 35 powerful tax-reduction strategies* specifically targeted for real estate. *Included are special tax provisions that authorize & support fully deducting real estate home-study courses and live seminars along with related travel, even if you do not own any properties. This is often a troublesome area with IRS…now resolved with our authoritative LLC documents. Business planning tool. Our OA also acts as an operating guide to enable you to effectively operate your real estate business. You may be asking this – “I am only a small operation, do I need all of this?” The answer is ABSOLUTELY, even more so because there is this basic rule of entity protection: The smaller the entity, the more the need for such complete documentation! 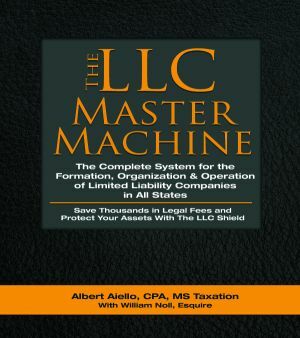 By having LLC legal provisions that may not pertain to you (at least for now), shows your meticulous attention to formality and gives your LLC the definite presence as an entity apart and distinct from its members operating as a separate legal entity, with a life of its own, difficult for any court to pierce its veil. The bottom-line benefits > you protect yourself against “Demons” such as money-lust lawyers, wrongful creditors, IRS and the like – saving you from having your valuable assets attached! Don’t be intimidated by a 121 page OA! It’s what is necessary to give you these great benefits of an LLC. Despite the length of the OA Extraordinaire, it is simple to complete with only about 7 or 8 entries to insert. 21 PROACTIVE* ENTITY FORMALITIES – To prevent piercing of the veil so your personal assets are protected. While they are extremely important in protecting you, once set up, these formalities are easy to follow and not time-consuming. In a lawsuit involving a small LLC, an attack on the non-use of entity formalities is often the single most powerful weapon of the opposition. Despite the fact that the LLC has been accepted by the state as a legal entity, without such formalities, claimants would find it considerably easier to prove that the LLC entity legally does not exist. Consequently claimants, along with their sue-happy lawyers, can seize your personal valuables. *Proactive means “preparing for, or controlling an unexpected occurrence”. You will hear so called “experts” say LLC’s do not have to keep minutes, or to hold annual meetings is not required. Even state statutes may allude to this. But by adhering to such formalities, even if apparently not required, shows your meticulous attention to formality, above and beyond what is generally thought to be required. This ensures, even further, that the LLC gives you limited liability protection like a gigantic shield. IRS > Another Demon! Without such formality, in the event of an audit, IRS may try to collapse the LLC entity in order to disallow member deductions such as travel, entertainment, meals, auto, education, etc. Other deductions could also be adversely affected. Negative Result: You lose tax $$$! Lawsuits Are Hell! – The results can be devastating. The loss of personal assets and the loss of LLC legal status for tax purpose could lead to a complete financial wipe-out and even bankruptcy, along with the emotional drain & strain on you and your family. All specially targeted for real estate operations with important real estate related matters; filled-in and ready to go. ALERT: Courts have stated that actions without notices and minutes can make the LLC members personally liable or bind the LLC to unwanted transactions. RESOLUTIONS – Resolutions are entity records of the official acts of the members of the LLC. They can be used instead of formal meetings, simplify entity management and save even more time. Resolutions authorize many important legal, tax and other financial matters. Ours are filled in for 20 important real estate related matters. “Brilliant documents!” ….Cheri S. Hill, President, CEO Sage International, Inc.
LLC CERTIFICATES ON DISK FOR EASE OF ISSUE AND TRANSFER – Includes both sides of certificate in plain language and readable print, not Martian script! Includes easy-to-understand explanation of both sides; step-by-step instructions to complete; sample-filled in formats for both sides. No more typing or hand printing difficult-to-read certificates. They can be completed in minute’s right on the computer. Included clear meaning of certificate terminology such as “sale”, “assignment”, “transfer”, along with income tax, gift tax, and estate tax impact of certificate transfers. LLC Certificate Register also on disk to record the issues of certificates (units) to the members and later transfers – Blank format with easy-to-follow instructions and a filled-in sample. Again, no more typing or hand printing; can be completed in minutes right on the computer. No need to pay for an awkward corporate kit. IMPORTANT! Issuing complete certificates and recording them in the certificate register is an important (yet rarely done) entity formality to help prevent the piercing of the veil and protect the personal assets of the members. Plus, it is indisputable evidence of your LLC membership, essential in the event of: Disputes with partners; divorce; incapacitation; IRS audits, death (estate planning); asset protection (transferring the LLC membership units to a trust). Sample articles of organization with techniques to keep the members off the public record. Blank and filled-in formats. • Operating agreement has complete table of contents for easy reference. NOWHERE else will you find this superior LLC system! Many law firms would charge much more, as high as $2,000, $5,000 even more for one LLC and not with these extraordinary documents! You Can Resurrect Your Existing LLC’s. These special LLC documents can be used to restructure existing LLC’s. Like magic…you can transform a debilitating LLC into a powerful vehicle of wealth protection that will save you substantially, year in and year out! You just replace the old forms with the LLC Master Machine Forms without having to have to notify the state, WITHOUT expensive lawyers. The Nevada Wealth-Protection Trust – A special Nevada trust giving you total privacy protecting all your assets from lawsuits, lawyers, probate, public-exposure, divorce, and other eradicators of your wealth – Protect your family from the most aggressive claimants or money-lust lawyers with this ironclad trust far superior than a revocable living trust. Equity Stripping – How To Use Only Two LLC’s To Protect Any Number Of Properties In Any Number Of States – Save thousands in state franchise fees, legal and accounting fees with this simple, ingenious, proven asset protection strategy.